Find out about our Bridges to Higher Education experience where we encourage the next generation to explore university education. Elle Hrobat, Project Coordinator at the Big History Institute shares her thoughts about the workshops. In August and September of this year, I was invited by Macquarie University's Learning, Education Aspiration, Participation (LEAP) program to lead Big History workshops for secondary school students in Penrith and regional high schools in Grafton and Kyogle. These workshops were a part of the Bridges to Higher Education program- a collaboration between numerous Sydney universities to offer widening participation and promote higher education opportunities for regional and remote school students. The days consisted of a range of workshops where students could come together to get a feel for different kinds of study offered at the tertiary level. The sessions offered wide variety ranging from midwifery, science experiments and 3D printing, psychology and journalism. As representative of the Big History Institute, I was faced with the task of introducing students who had never encountered Big History, to a preview of 13.8 billion years in 45 minutes. Big History has a lot of content, and I'm no David Christian to tell it in 18 minutes! So I decided to concentrate on the idea of claim testing and critical thinking- focusing on how we decide what claims of knowledge to trust. I gave the students two Big History claims, and one unrelated claim, and then asked them to argue why they accept or reject them based on Intuition, Logic, Authority and Evidence. I am particularly drawn to the idea of Claim Testing because it is such an eye opening process when one has to be self-reflective about the different kinds of knowledge that they may have previously taken for granted. Also, to be offered that kind of critical thinking in secondary school gives a certain agency to students to really take ownership of their knowledge. That kind of 'thinking about thinking' is something I really only encountered in perhaps Extension English in Senior School, and then when I went on to University. Needless to say, the students relished the opportunity to argue why they accepted or rejected diverse claims. The opportunity to work with students of all kinds of cultural backgrounds, world views and belief systems actually enriched the telling of Big History itself. For example, one claim the students tested was 'Everything comes from a dying star.' Obviously, if you've never heard of this claim it might sound outlandish! However, the mix of scientific as well as spiritual interpretations from the students- most of which were predicated on origin stories that were familiar to them-was fascinating to unpack. I think a key part of the students' engagement was cultivating a safe space in which they could voice why they accepted or rejected a claim of knowledge. I found this was useful with the claims that were received based on intuition. The students learnt this is still a very valid claim tester, as it often acts as our first filter when receiving information. Once they learnt that there is no right or wrong answer, because we were all in effect deconstructing how we receive different claims of knowledge, you could tell the students were intrigued, even those who may have previously acted disinterested. The workshop generated some great discussion in light of Big History. The success of the day demonstrated that Big History is accessible to all, as David Christian might say; everyone seems to have some kind of interest or preconception of "how we find ourselves buzzing with life on this tiny planet" and where we might be headed. Students learnt that when thinking about real world problems, it is important not to possess tunnel vision in relation to ideas or disciplines, but rather, think laterally and across multiple ideas. 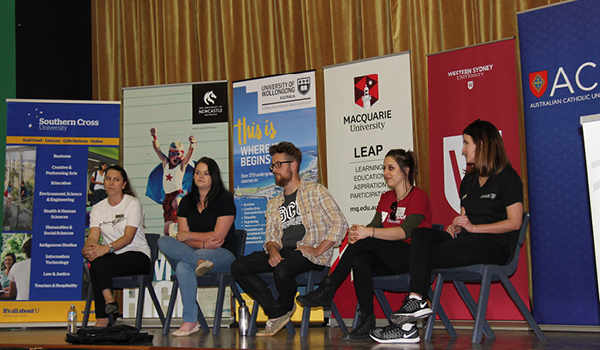 Working with Macquarie's LEAP program was a wonderful opportunity to not only introduce Big History, but to collaborate with other educators who are passionate about their fields and pass that on to students who may have never seriously considered their options in higher education.